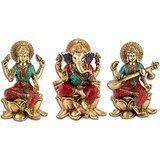 These are Ganesha Lakshmi and Sarasvati Statues sitting together. These are worshiped together in Hindu methodology for Health, Wealth, Prosperity and Luck.Beautiful Very Rare, Hand carved , Solid metal brass and turquoise Gemstone work on body of God Ganesh, Goddess Lakshmi and Sarasvati. The pair is known and worship. This beautiful antique reproduction style statue is of brass material with fine carving of Turquoise and some other precious stone. Size : 9.5 (H) X 6 (L) Inches, Weight : 12 KG, Material: Solid brass ------------- Pls beware from Copy product & ensure buying authentic product. This is exclusive product of Brand " Collectible India" and "covered by intellectual property rights laws". 'Collectible India' do not authorize any other Brand/Seller to sell it and won't be responsible if any copy or substandard product send by any other seller.